The Freedom in Christ Discipleship Course facilitates important steps in every spiritual journey. This course is structured to guide participants from the first step of embracing belief in a living Christ, to finding the truth of who they are in Christ, to resolving personal and spiritual conflicts through genuine repentance, and then on to maturity as a disciple. The course is flexible enough to be used in a variety of church situations, from Sunday teachings to small groups, as well as for a variety of audiences, from people who have not yet committed to Christ to established Christians. The course materials include a Leader's Guide with a CD of PowerPoint slides, a workbook for course participants, and a set of DVDs. The workbooks contain exercises that are incorporated into the lessons and are strongly recommended, especially in the small group setting. The DVD set is optional. 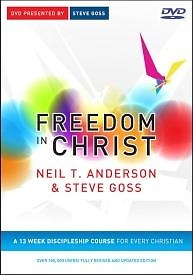 It contains footage of each lesson as taught by Steve Goss, international head of Freedom in Christ ministries, and offers a way to teach the course without having a leader prepare each lesson. Freedom in Christ for Young People is the corresponding course for ages 11-18 and is also available with a Leader's Guide and two age-group specific workbooks.